1. Be pleasant and courteous – a smile can go a long way towards improving a customer’s mood. Greet them promptly and ask them how they are doing. Simply being nice can go a long way towards a good dining experience. 2. Have a solid understanding of the menu – if your menu regularly changes, this is especially important. The wait staff should be able to describe each dish, and should know what can be substituted in any meal. If they can’t answer basic questions about the menu, guests are likely to question the reliability of the entire establishment. 3. Check in regularly, but don’t hover – your guests shouldn’t have to hunt you down when they need something. Stop in regularly and see if they need anything, but don’t be excessive. 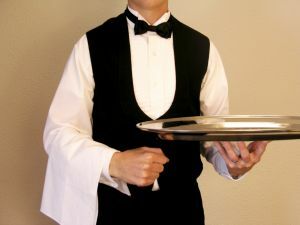 Keep your eyes open for customers that are finishing their meals or appear to be looking around for their waiter, and step in to see what they need. A little extra attention can go a long way towards creating world class customer service in your restaurant.